Your pocket door will slide like butter. Stop fighting with your sliding glass patio doors. Commercial manual door repair done fast! Sliding glass patio door repair. Pocket door repair. Manual storefront commercial door repair. We do it quickly, affordably and accurately. Get yours done. Brian did a great job! He's a perfectionest and won't stop until the door is perfect. I am very happy with his work. Sorry, we do not repair bi-fold or bi-pass doors. Call us at (954) 635-8169 to learn how quickly we can be at your location. We Will Visit Your Home or Business Monday – Saturday between 8:00 a.m. and 6:00 p.m.
We Use Only The Best, Heavy-duty Hardware, preferably made in the U.S.A.
We offer a wide variety of styles and finishes for all applications. Do you have a sliding glass patio door repair project? 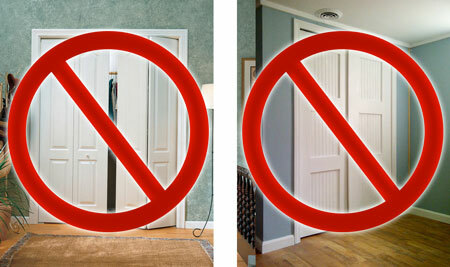 Or a pocket door repair that needs doing? Accutrack Door Repair by Brian is located in Fort Lauderdale, Florida. We also repair manually-operated commercial store front doors. We have been fixing these types of doors for decades. Sliding glass patio door rollers, patio door track repair, and pocket door alignment are just some of the things that we do to fix hard to open sliding doors. 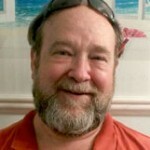 We service South Florida homes and businesses in Broward, North Dade and Southern Palm Beach Counties. Neighborhoods in Aventura, Hallandale, Hollywood, Davie, Southwest Ranches, Pembroke Pines, Plantation, Weston, Miramar, Boynton and Boca Raton have benefited from our services. Accutrack Door Repair by Brian has been servicing the tri-county area since 1985. Our rates are competitive and we welcome calls for a no-obligation estimate. Visit our testimonials page to read what our customers have to say and call Brian at (954) 635-8169 today for more information. 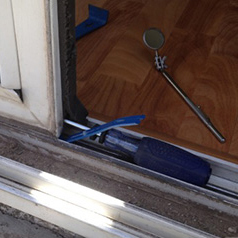 Patio sliding glass door repair, pocket door repair and manually-operated commercial storefront door repair. Oakland Park sliding glass door repair leads to unexpected result.